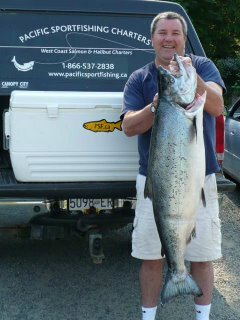 Hello to Port Renfrew fishing fans around the world! 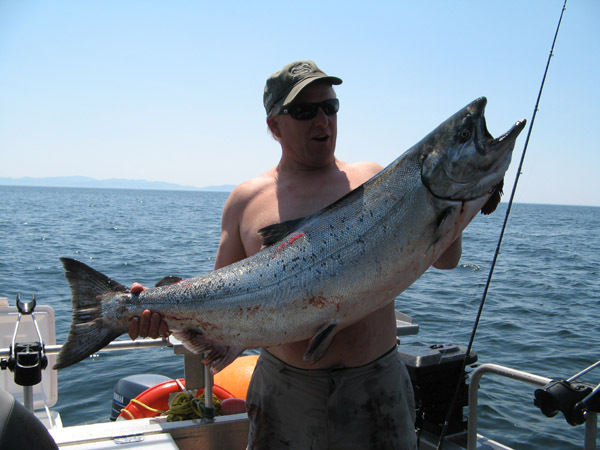 Jolly Rogers Fishing Charters reports the fishing in Port Renfrew has been great lately. The coho have arrived early on Swiftsure Bank. They are small, 5-7 pounds on average, but there’s a LOT of them. If you lighten up the gear and let them run a bit, you are in for some fishing fun. We are very hopeful that this early coho action means an excellent season later this Fall….spent a summer fattening up, then the fun really begins in Sept/Oct! 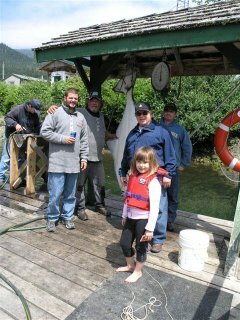 The halibut fishing on Swiftsure Bank has been steady…plenty of “chickens” coming in. Chinook salmon fishing has been steady too — while it isn’t the frenzy of a month ago, there are plenty of springs around, and there’s a few big ones around. So definitely worth the effort! Crabbing in San Juan Harbour continues to be excellent. It’s starting to approach prime time for Port Renfrew fishing….time to get out and give it a go. John at Hindsight Fishing Charters sent in this halibut fishing story from a guest, Terry M: “I caught this monster halibut yesterday fishing with John. It weighed 132 pounds. It took over two hours to get it into the boat. I fought it for the first hour, then Corbin took over. It took two harpoons by John to finally do it in.” Nice fish….well done! 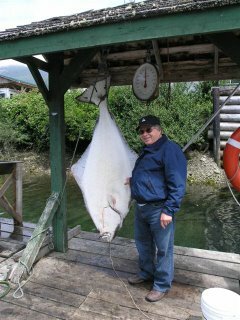 Trevor from No Bananas Fishing Charters also confirms that the halibut fishing in Port Renfrew is pretty decent of late. However, the spring salmon seem to have moved on — the great fishing a few weeks ago has led to pretty spotty chinook salmon fishing of late. The good news is there’s lots of coho salmon though. It is pretty certain the spring salmon will once again begin appearing in numbers any day…the question is whether that will be today, tomorrow, or next week! Port Renfrew Marina is reporting typical June fishing. It isn’t as hot and heavy as a few weeks ago for salmon, but the fish are still there…just fewer and farther between. 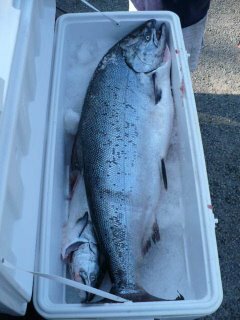 There have been two 40 pound plus Spring salmon caught this week, plus a bunch of 30 pounders. Not bad if you can catch them! Here’s Keith Cook with a 42 pounder caught last week. Crabbing is still excellent, big crabs and many, many of them. Getting to Port Renfrew will soon be easier! With the Cowichan road paved, accessing Port Renfrew from either Victoria/Sooke or from Duncan/Lake Cowichan may be equally good. In fact, with the Cowichan road paved, it may even be easier, especially for those towing boats — those bouncy sections on Highway 14 are hard on trailers. This should be a great help to Port Renfrew’s tourism. The last five kilometres of the once-infamous road between Port Renfrew and Lake Cowichan will be paved next week, providing the final link in a scenic circle drive for tourists and an alternative for drivers when the Malahat is blocked — provided they have plenty of time. The 52-kilometre stretch, slowly upgraded over several years from a zig-zagging logging road, was well known for breaking axles, bursting tires and skiddy, gravel-topped curves. Four years ago, the road was spotlighted when the province invented the Pacific Marine Circle Route as a marketing tool to attract tourists. It became a segment of a circuit running from Victoria through Duncan, Lake Cowichan, Port Renfrew and Sooke. But the Port Renfrew-Lake Cowichan link was so bad that tourists had to be discouraged from using it unless conditions were perfect or they had heavy-duty vehicles. Some help came in 2007 when a newly applied coating on Highway 18 failed. The coating was stripped off, remixed with other road-building material, and used to upgrade the Port Renfrew-Lake Cowichan road. Other parts of the road were gradually paved or chip-sealed, but five kilometres in the middle remained in rough shape. “You definitely needed a four-wheel-drive for that,” said Port Renfrew Chamber of Commerce director Rosie Betsworth. But from early next week, it will be an easy drive, said Transportation Ministry spokesman Dave Crebo. Port Renfrew residents hope the completed road will bring more tourists. For Dorothy Hunt, Pacheedaht First Nation band manager, who works in Port Renfrew and lives in Lake Cowichan, the paved road will reduce the commute to about 50 minutes. “And we need that out here to create jobs,” she said. Crebo said $11 million is being spent on replacing two bridges on Highway 14 and straightening some of the curves. One bridge will be completed this fall and the second by the fall of 2010, he said. Dan Harvey, from Pacific Sports Fishing, sent in this picture of a beautiful 45.5lb Chinook salmon caught off Port Renfrew Thursday. Great summer weather, BIG salmon, halibut plentiful, crabbing amazing….what more incentive do you need? Get out to Port Renfrew and get fishing! The fishing season is kicking in along Vancouver Island’s wild west coast. Des from Vicious Fishing reports limit catches of Chinook salmon, 15-30 pounds, and halibut from 15-120 pounds. The two Johns, Jolly Rogers and Hindsight Fishing, took a trip out to Swiftsure Bank on Monday and found lots of coho. That’s a good sign of what’s to come…big fun to be had out there….time to start heading far, far, west. Speaking of fun fishing days…Jolly Rogers posted a youtube video of a halibut adventure last week. Check it out. Finally, the crabbing in the Harbour out front of Port Renfrew continues to be amazing. You are currently browsing the Port Renfrew Fishing Report blog archives for June, 2009.